Fall planting season has begun, but many people who would like to grow their own food may not live somewhere conducive to gardening. 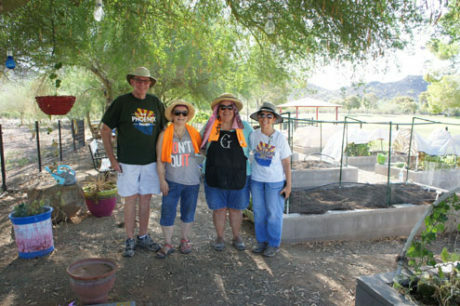 Getting the Mountain View Garden ready for the fall planting season are, from left: volunteer Michael Brace; Debra Rosenberg, Sunnyslope Senior Center assistant; and Gail LaTour and Cindy Moss from Keep Phoenix Beautiful (photo by Teri Carnicelli). Keep Phoenix Beautiful (KPB) wants to remind residents who have a green thumb, but no green space to plant, that Phoenix has community gardens where you can “rent” a large planter box and perhaps share the tending duties with a friend or neighbor. Both gardens in North Central Phoenix—the Pierson Street Garden and the Mountain View Garden—are ready to welcome new hobby gardeners as they get ready to plant lettuce, carrots, radishes, beets, turnips, garlic, onion and more. The best time to plant these seeds is when the mornings are cool, which typically begins in late September. Each community garden allows locals to “rent” a plot and grow vegetables, herbs and more. The cost is between $6 and $10 a month, but KPB is hoping some area businesses will “sponsor” a few boxes for people who can’t afford the monthly fee but want to grow their own food. “We would have a sign made to indicate which garden bed they sponsored,” said Terry Gellenbeck, recycling director for Keep Phoenix Beautiful. Gail LaTour, a Master Gardener who oversee both gardens and offers gardener assistance on-site, said the plots are the perfect size for small groups, such as classrooms, friends, a family, or even various nonprofits that service the homeless, veterans, and senior citizens. In fact, one of the Mountain View plots—a larger than normal size—will be tended to this fall by members of the Sunnyslope Senior Center Intergenerational Program, working with teens from the Sunnyslope Youth Center. The garden at 1822 W. Pierson St. was created after the PHX Renews plot at Central Avenue and Indian School Road was taken down when the property was sold last year. The owners of the Pierson Street property, Vivo Development, had no immediate plans for the site and voluntarily tore down two abandoned houses and cleared the site to make room for the 1-acre community garden. There are about 40 garden beds and 15 are unassigned. Mountain View Garden, 9901 N. 7th Ave., was first established in 2013, but after a couple of years of sitting mostly unused, a new push to get the garden going again took place in November 2017. Planter boxes were refreshed with new soil, and as a bonus each box now sports its own water supply, courtesy of nearby Butler Hydroponics. For the fall season, about a half-dozen beds are still available to rent. Keep Phoenix Beautiful will help to organize educational events, Scout projects, composting and recycling projects, and more at both locations this fall. For more information, e-mail Garden Manager Gail LaTour at gail@keepphoenixbeautiful.org, or call 602-314-6445.